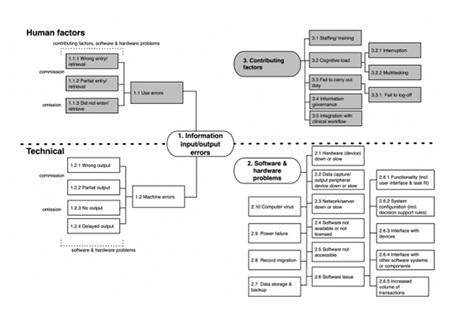 Our classification of human factors and technical problems that contribute to IT incidents. The systematic analysis of critical incidents is well-established in medical practice. Incidents can trigger root-cause analyses in health services, or provide early warnings of unexpected drug reactions or infectious outbreaks. Our research extends these methods to incidents associated with e‑health (i.e. patient harm due to an IT problem or difficulty in using software), and we are pioneering this approach internationally. To detect IT incidents in general practice we have developed and trialeda new incident-monitoring system called TechWatch. Incidents can be reported to TechWatch either online or over the phone to trained operators. Since 2009 we have analysed 1,385 IT incidents in Australia, the United States and the United Kingdom. The methods our research has generated have become the de facto international standard to detect and classify IT incidents. Our classification had been used to examine 4,883 incidents, including by governments in the US and UK. In 2012 the Pennsylvania Patient Safety Authority used our classification system to examine one of the largest repositories of incidents in the US, and issued a Patient Safety Advisory with specific recommendations for the procurement, implementation and use of IT systems. At the same time the ECRI Institute, a US federal patient safety organisation, used our classification to undertake an in-depth analysis of incidents nationally (called a Deep Dive™). In the UK our classification system was used by the National Health Servicein Wales and we collaborated with the Health and Social Care Information Centre in England to examine incidents from one of the largest civilian IT programs ever undertaken worldwide. Most recently our classification was implemented into the provincial incident monitoring system in British Columbia, Canada - BC Patient Safety & Learning System (BC PSLS). We welcome enquiries about our classification and are happy to assist individuals and organisations who wish to use the schema to analyse IT incidents. Magrabi F, Baker M, Sinha I, Ong MS, Harrison S, Kidd MR, et al. Clinical safety of England's national programme for IT: A retrospective analysis of all reported safety events 2005 to 2011. Int J Med Inform. 2015;84(3):198-206. Magrabi F, Ong MS, Runciman W, Coiera E. Using FDA reports to inform a classification for health information technology safety problems. J Am Med Inform Assoc. 2012;19(1):45-53. Magrabi F, Ong MS, Runciman W, Coiera E. Patient safety problems associated with heathcare information technology: an analysis of adverse events reported to the US Food and Drug Administration. AMIA Annu Symp Proc. 2011;2011:853-7. Magrabi F, Ong MS, Runciman W, Coiera E. An analysis of computer-related patient safety incidents to inform the development of a classification. J Am Med Inform Assoc. 2010;17(6):663-70.